A rare, pygmy sperm whale stranded in Co Kerry has been recovered by the SDWF and its skeleton prepared for display in the centre. 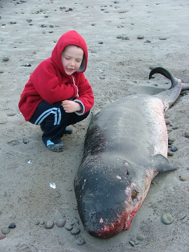 On 28 November SDWF Project Manager, Dr Simon Berrow, was sent images of a whale stranded at Ballyheigue on the 22 November. reported as a polit whale it was undoubtedly a pygmy sperm whale, one of the rarest whales in Irish waters with only 6 reported strandings ever and no sightings. Kerry County Council buried the whale on the 26 Nov but after an unsuccessful attempt to dig it up the whale rose out of the sand itself and deposited itself on the beach. With the help of Mick O'Connell of the Irish Whale and Dolphin Group the whale was transported to Kilrush where the caracas was flensed and the skeleton sent to Dublin for preparation.